Roses do not cling to the wall themselves like some plants do. Therefore they will require tying in. On a wall it is a good idea to put up trellis or wires for this purpose. As the rose grows it should be encouraged to grow horizontally outward and upward. The lower stems straight out where possible and the taller ones, up and then outward. In this way new growth will be encouraged, as will more flowers. On a pillar it is best, where possible to train the branches around it for the same reason as above. Ramblers for trees will need to be tied to the trunk to begin with until the branches meet those of the tree, thereafter, the tree will act as a natural support. 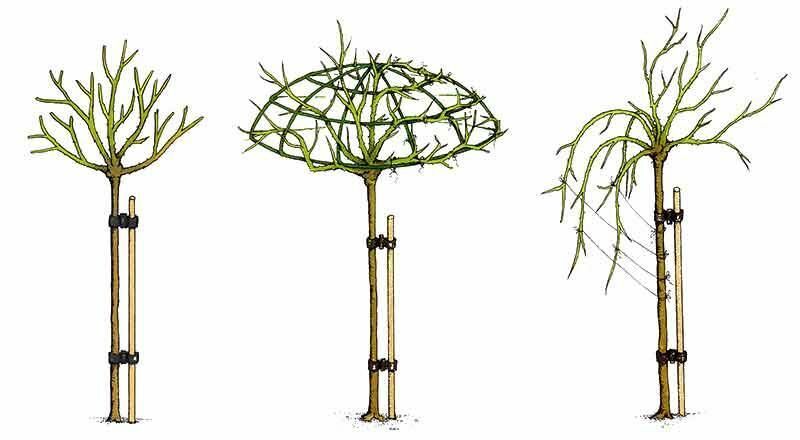 To prevent all the flowers appearing at the top of a trellis, wall or fence, curve and arch the stems as much as possible, rather than keeping them straight. 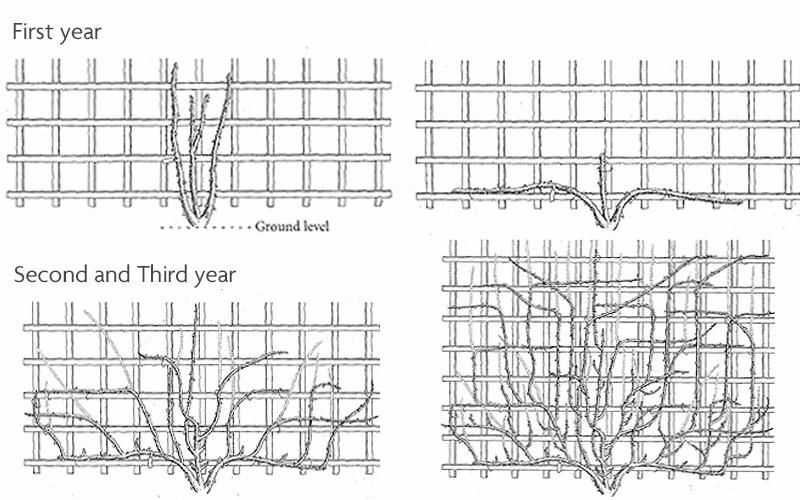 This will encourage side lateral growth which will encourage flowering lower down the plant. 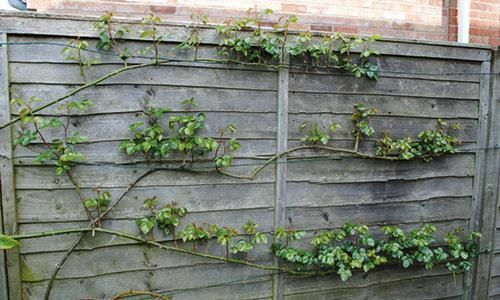 Attach stems to the trellis using loosely tied green string. A standard tree rose must always be staked for the weight of the rose, especially when in flower could cause it’s brittle stem to bend and snap. A wooden stake is the best. Strap the stem to the stake with purpose made ties and guide the spacer, usually part of the tie, between the stem and the stake to prevent rubbing. A weeping standard will need to have it’s branches trained. There are a couple of methods for doing this. One is to purchase an umbrella cage. These are usually metal and can be fixed to the top of the stake. The umbrella consists of band of metal in the shape of an umbrella. The arching branches can be tucked under it and tied in place if necessary the flowers allowed to peer through. Alternatively, use soft garden string tied to the branches and pull them downwards, attaching the other end of the string to the stake. The look that is achieved is far more natural. It is true that some shrub roses can be a bit lax and floppy in growth and will often spill over. The answer is to either prune them hard or support them, unless you like the manner in which they are growing and have a big enough garden to accommodate them. There are several ways of giving these roses the support they need. An obelisk or wig-wam made from wood can work nicely. Place the structure over the rose, then tie the branches to it from within to allow the flowers to protrude through. Alternatively a ring or a square support on legs can be placed around the plant whilst it is still small enough to take it, the branches are then encouraged to tumble over it. Another rather attractive method is to peg the branches down. As they become long enough pull the arching branches to the floor and simply peg them there using pegs rather like tent pegs. Obviously the garden needs to be big enough to take this method, but the naturally created fountains will become fountains of flower when the roses are in bloom, for they will be encouraged along the whole length of the stem. Many of the Bourbons and Hybrid Perpetuals are ideal for this method of training. This ‘pegged down’ rose will look fabulous when it comes into bloom.